Over a period of three years, the three parties will cooperate on healthcare innovation, research and education to help elderly patients in CGH and community hospitals under SCH. 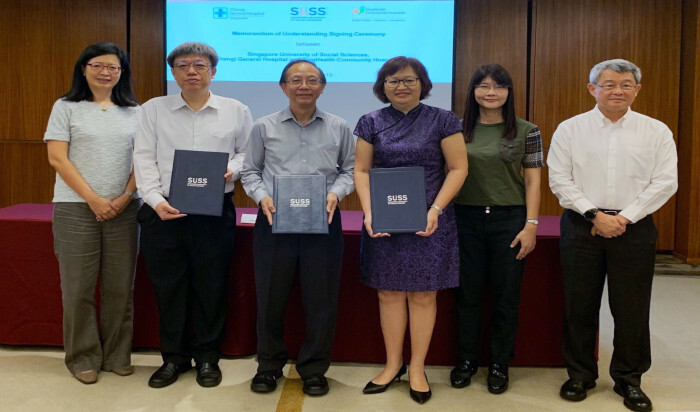 The Singapore University of Social Sciences (SUSS) signed a Memorandum of Understanding (MOU) on February 23 with Changi General Hospital Pte Ltd (CGH) and SingHealth Community Hospitals (SCH) to collaborate on various initiatives to better understand and support the needs of the growing silver generation as well as their caregivers. Over a period of three years, the three parties will cooperate on healthcare innovation, research and education to help elderly patients in CGH and community hospitals under SCH. They aim to raise awareness of ageing issues as well as advocate for a better environment for seniors, as part of SUSS' Geron EngAGE initiative. The Geron EngAGE initiative is a social network for SUSS Gerontology alumni, students, faculty and industry players in the eldercare landscape and aims to provide a platform to raise greater awareness of the work of gerontologists through evidence-based inputs and educational activities. From 1965 to 2015, Singapore’s population grew from 1.9 million to 5.5 million. However, the number of citizens aged 65 and above is increasing rapidly, as population growth slows. The size of this group of citizens doubled from 220,000 in 2000 to 440,000 in 2015, and is expected to increase to 900,000 by 2030. A rapidly aging population will require more healthcare attention and resources, as well more initiatives to improve the quality of life of seniors who are living longer. In the US, the number of seniors is expected to grow to 74 million by the year 2030, according to a CDC healthy aging report. In October 2018, Miami-based startup Papa, an online service that links college students to seniors for practical services and companionship, raised $2.4 million in a seed funding round. Aging in place has been a hot topic and more companies are looking to link seniors to resources that enable this. Last year, a software developed by Oxford University spin-off Oxehealth which allows a digital video camera sensor to measure patients’ vital signs remotely was approved as a Class IIa medical device in Europe. Believed to be the first accreditation of its kind for this type of technology, it will be hugely beneficial to public and private sector organisations that care for elderly and vulnerable people, whose staff cannot be present in every room or do not wish to interrupt the rest of the people they are looking after. "In our community hospitals, a high percentage of our patients are seniors who are above 60 years old. Our clinical team hopes to improve our understanding of the ageing issues surrounding this demographic by working closely with SUSS and their Gerontology students, to deliver better care for our elderly patients. This collaboration is fitting with our endeavour to continuously innovate new models of care at SCH, where we seek to understand our patients and their needs so that we can provide person-centred care for our patients to achieve health goals together with them. I look forward to positive outcomes for our patients, and I believe that there will be many useful learning points to prepare us better for the healthcare challenges of our elderly population," said Ms Margaret Lee, Chief Executive Officer of SingHealth Community Hospitals. Adjunct Professor Lee Chien Earn, Chief Executive Officer, CGH, said: "We are excited to partner SingHealth Community Hospitals and SUSS to create a health ecosystem that is not just elderly friendly, but also enable and empower our elderly to keep well, get well and age well. We hope to improve care outcomes and quality of life of our patients and community by learning from each other, and synergising our respective capabilities in healthcare innovation, research and education."